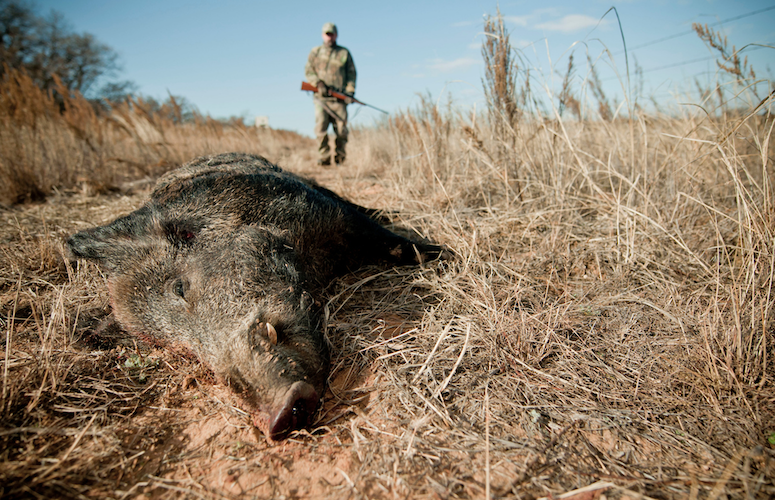 There are few critters that I enjoy hunting more than feral hogs. They are wary, large, destructive, have no bag limits and in most places can be hunted year-round — and they are delicious to eat. Living in Alabama, I’m surrounded by great hog hunting. I’ve taken the porkers from Florida to Texas and most humid states in between. My preferred method of hunting is cruising agricultural fields in the middle of the night and dropping as many hogs as possible with an AR-15 topped with night vision or thermal optics. I’ll pass up the largest, stinking boar in the group to take out sub-100-pounders until my cooler is full. Swine brucellosis does not affect the edibility of the meat, but it should be thoroughly cooked to 160 degrees. I’ve prepared the porcine meat a number of ways — ground and stuffed into casing for bratwursts and boudin or marinated and grilled. One Thanksgiving I brined an 18-pound bone-in hindquarter for 24 hours then smoked it for 18 hours until it reached an internal temp of 185 degrees. I then pulled the meat right off the bone and served pulled pork BBQ sandwiches right alongside the turkey. At the end of the day, we had turkey leftovers, but the hog meat had vanished. I’m clearly a fool about cooking feral hog meat, but I have to stress the importance of taking precautions when butchering and handling the raw meat. Feral swine are known carriers of swine brucellosis, an infectious disease of pigs, which is caused by the bacterium Brucella suis. Humans can contract swine brucellosis if blood, fluid or tissue from an infected animal comes into contact with the eyes, nose, mouth or a skin cut. Swine brucellosis does not affect the edibility of the meat, but it should be thoroughly cooked (160 degrees). Although few humans die of infection, the disease is often chronic and debilitating. If a hunter gets sick with flu-like symptoms, remember to inform the doctor of any contact with a feral hog. Wear eye protection and rubber or latex gloves when handling carcasses. Avoid direct contact of bare skin with fluid or organs from the animal. After butchering, burn or bury disposable gloves and parts of the carcass that will not be eaten. Avoid feeding raw meat or other parts of the carcass to dogs. Wash hands as soon as possible with soap and warm water for 20 seconds or more. Dry hands with a clean cloth. Clean all tools and reusable gloves with a disinfectant, such as diluted bleach. Thoroughly cook the meat (internal temp 160 degrees). Be aware that freezing, smoking, drying and pickling do not kill the bacteria that cause brucellosis.